Fr. Edgar da Cunha, S.D.V. On February 1, 1987, Fr. Edgar da Cunha, S.D.V. was appointed Pastor of St. Nicholas Church. It was certainly a challenge at the age of 33. The parishioners had confidence, faith, and trust that Fr. Edgar had the qualities of an administrator and spiritual leader. Looking back over those years, quickly comes to mind the provocative, constructive, meaningful, and enjoyable ones which have been planned, organized, and followed through by Fr. Edgar. 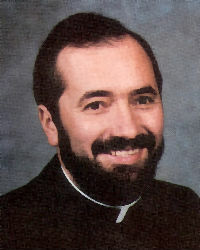 His pastorship has witnessed co-sponsorship to St. Nicholas School, the creation of the Dinner-Show, Evangelization with small Christian Communities, the formation of Bible Study Groups, Italian Rosary Group, the Jr. and Sr. Legion of Mary, the institution of the Mass in Portuguese and First Friday Adoration. The following Vocationists have contributed to the growth of St. Nicholas Church while Fr. Edgar was its Pastor: Fr. Rene Lima, S.D.V., Fr. Anthony Ferreira, S.D.V., Br. Harold Fernandez, S.D.V., Fr. Severino Martini, S.D.V., Fr. Robert Vass, S.D.V., and Fr. Anthony Basso, S.D.V. Fr. Antonio L. da Silva, S.D.V. Also born in Brazil, Fr. Antonio Lisboa da Silva, S.D.V., was ordained priest in the United States in 1983 and had previously served at St. Nicholas, but had been at St. Michael’s church in Newark for the past years. It was Fr. Antonio’s first experience as pastor. Fr. Antonio was a bit more reserved, not as communicative as Fr. Edgar. It did not take long for him to familiarize with his flock and to become one with them. Fr. Antonio’s years at St. Nicholas were marked by numerous fundraiser events and activities. The “Sagrada Familia” group formed by Portuguese speaking parishioners grew larger due to the climbing number of Brazilian immigrants arriving in the area in the early 90’s. Seeing the need to fulfill their desire for social gathering as much as spiritual guidance, Fr. Antonio created cultural events like “Feijoada” and “Festa Junina,” that attracted Brazilian families searching for interaction with their fellow co-patriots. He also approved the first “May Crowing of the Blessed Mother” by not less than 35 little girls dressed as angels, as it was very traditional in Brazil. The “Buon Pastore” group also received special attention from Fr. Antonio, who learned to speak their language and celebrated their Sunday masses, participating in their Bible Studies and Holy Rosaries. He made close friends and St. Nicholas became his family. His straight forward way to be gave all a sense of honesty, trust and confidence. Parishioners learned to love Fr. Antonio and they felt love in return. Fr. 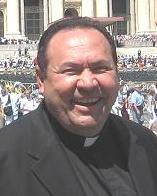 Antonio da Silva was pastor of St. Nicholas from 1994 to 2003.